I’ve partnered with HomeRight and have received product and/or compensation in exchange for this post. As always, all expressed opinions expressed are 100% my own. Sorry I’ve been quiet on the blog front. It’s been busy over the last several weeks, as I’ve been spending all of my free time trying to finish this kitchen cabinet makeover, and I can say that I have fallen in love with my kitchen thanks to the ease of this makeover thanks to my HomeRight Super Finish Max sprayer! Earlier this spring, I was craving change in my kitchen. Something a little brighter, but not the standard all white kitchen. So when HomeRight offered to send me their newest Super Finish Max paint sprayers, I was all in and immediately got to work on picking a paint color for my cabinets. 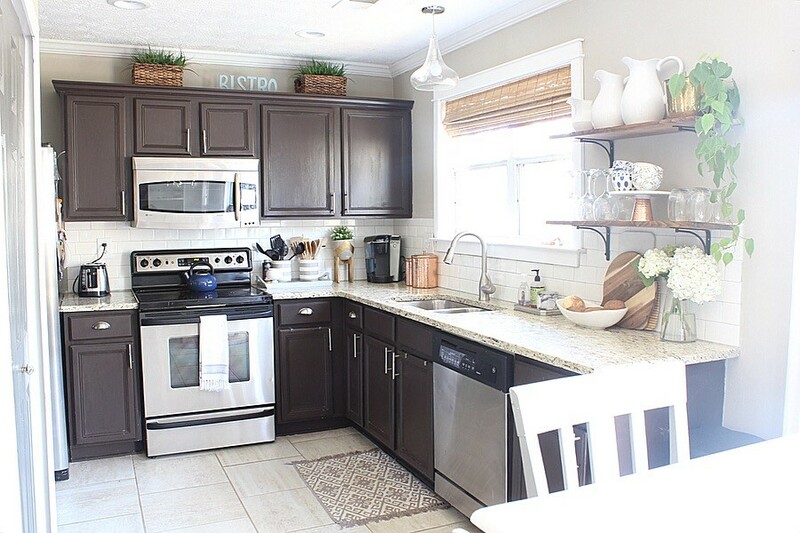 At first I was leaning toward painting it a light gray color, but could never find the “right” gray, that would complement my counters and floors, without everything coming out looking too beige. These are a couple of samples from Behr, color matched from Benjamin Moore, but none of them spoke to me. Then through a simple text to my friend and blog buddy Carli, a new concept was born. Dark lowers and light uppers. I never even thought about this idea because I never thought of this style as me, if that makes sense. But since I trust Carli, and adore her style, I went for it to get out of my comfort zone. We decided to use Night Blooming Jasmine on top, and Private Black on the bottom which is a charcoal gray black color. I have to be honest, I was so nervous and wanted it to be perfect, so the prep work was key! To begin, I removed all of my kitchen handles, drawer fronts, and doors. I placed each door hinge in a sandwich bag and numbers each bag so that it aligned with the drawer or door that I removed. For example, the top left cabinet was #1. I placed a piece of tape inside with the #1 written on it, and wrote the corresponding number on a bag and placed the hinges inside. I also added painters tape the floor where the base of the cabinets met, and to the wall where the cabinet met. Next, I set up a space in my garage to begin priming the cabinets. Since they had been painted before, I opted to lightly sand with 60 grit sandpaper, going in an up and down motion. 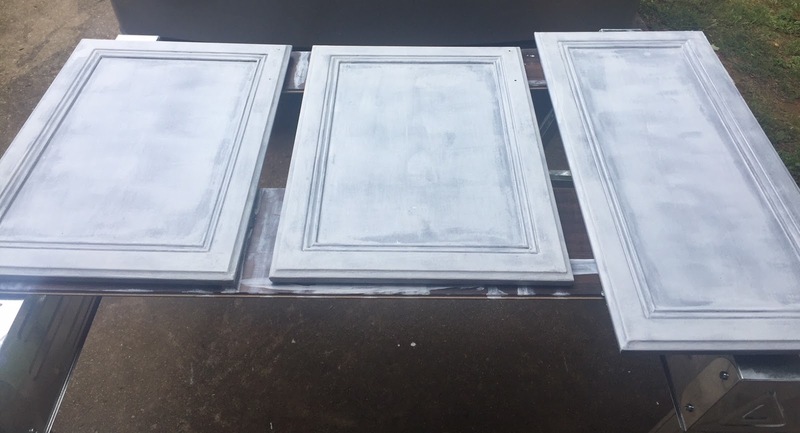 After sanding, I wiped them down with a damp cloth, let them dry a moment, then painted them using a water based primer by Kilz. To apply the primer, I used a foam roller. I let the primer dry for a few hours in between coats. Once I applied the second coat, I let them dry for 2 days to ensure that it cured properly. I followed the same steps for each cabinet on each side. Once the cabinets were primed and were dry, it was time to paint. This is when my HomeRight Super Finish Max paint sprayer came into play and when I say using this made this process 1000x’s easier than we we painted our cabinets the first time, that is an understatement. To set up the sprayer, included in your box are the setup instructions, which were clear and easy to understand. Once I got the sprayer all setup, it was time to get to work! I made a makeshift spray station and the process was so seamless and easy to do. It probably took me around 2-3 minutes to spray each cabinet, no lie. What I love about the sprayer is that is distributes the paint so evenly, with as little paint as possible, which allows you to build upon each layer as your paint. So the finish is flawless and the best thing is that there are NO BRUSH STROKES!! During those 2 days, I painted the cabinet bases with just a foam roller. spraying indoors in just too messy for my taste, but can be done with the right preparation. After everything was dry, I put the cabinet doors and drawer fronts back on and applied my new hardware from Home Depot. And can I tell y’all… I love how it came out. I plan to change the pantry door color to a lighter gray color as well. I opted for brushed brass hardware this time and I absolutely love the look that it provides. I’d like to say a HUGE thanks to HomeRight for sponsoring this post. My HomeRight Super Finish Max sprayer made this project so much easier and I will never ever ever ever hand paint another piece of furniture or cabinet doors. I think I may even try to use in to paint my dining room walls when I tackle that project. I will just take the extra time to cover everything to avoid overspray. You can view all of HomeRight’s user friendly products over on their site. So tell me, what do you think? Do you think that you will be trying the HomeRight Super Finish Max sprayer on your next project? Let me know! Next Post Changing Things Up! OMG Erin…I love the makeover and yes I need to go get this sprayer asap. I've been looking for something that evenly covers my DIY pieces like repainting bookcases and such. This makeover is life and the brushed brass hardware was the perfect finishing touch. Yep, the coverage is PERFECT! You cannot go wrong with this sprayer in my opinion. Thank you for checking out the post! Erin, Wow! great job! Your kitchen looks so much brighter and inviting. I love that you painted the lower cabinets a different color. Thanks for the info on this sprayer. Thank you Marsha for checking it out! And thank you. I love the makeover! Thank you Ellen. I think if you prime them thourougly you could get it to work! Thanks for stopping by. Erin,You did a GREAT job! Congratulations on your beautiful new kitchen. Any reason you can’t apply the primer with the sprayer as well? It was all out of preference to be honest. No particular reason other than the fact that I didnt want to have to set up my spray station all of those times. You can certainly use the sprayer for primer as well. That looks great! I love how just painting the top cabinetry brightened the space tremendously.. and the brass knobs were definitely winners.. LOVE YOUR KITCHEN! !